These doomed love stories and twisted fairytales explore the lives of women—particularly queer women and mothers—and reveal the monsters lurking in our daily lives: the madness, isolation, betrayal, and regret that arises as we seek human connection. Readers are taken to places where the sun never sets, where cornfields rustle ominously and sleepwalkers prowl the night. In “Weekend,” the lead actors of an avant-garde television show begin to confuse their characters’ identities with their own; in “Go West, and Grow Up,” a young girl living in a car with her mother is forced to shed her innocence too soon; and in “Safekeeping,” a woman trapped inside a futuristic safehouse gradually unravels as she waits for her lover, who may never return. Powerful, unsettling, and wildly imaginative, Night Beast is a mind-bending, genre-hopping debut. Stories from this collection have appeared in Kenyon Review, The Masters Review, Lightspeed, Hayden's Ferry Review, Mid-American Review, DIAGRAM, Juked, and SmokeLong Quarterly. Kelly Link chose the title story as the winner of The Masters Review's 2016 Fall Fiction Contest. "What pure pleasure to recommend to you the debut collection of Ruth Joffre, whose stories are nimble, audacious, and far seeing." "The force of Night Beast is seismic; I was startled to read a first book so daringly original. Ruth Joffre’s dissident, imperiled characters are intricately drawn and deeply surprising. While working in the tradition of Djuna Barnes, Isak Dinesen, Ursula K. Le Guin, and Mary Gaitskill, Ruth Joffre manages to be sui generis, a singular young writer reconfiguring the possibilities of fiction at the dawn of — please gods — a dazzling career. There is nothing like her. And there never was." 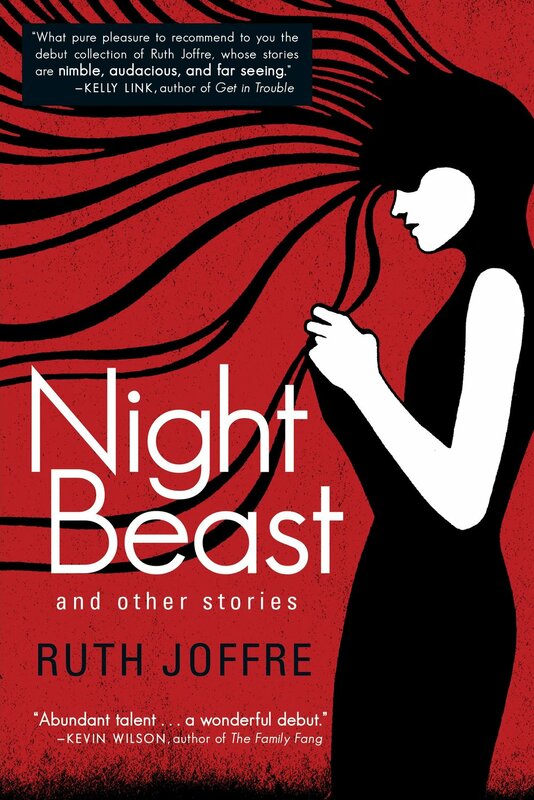 "So many of the characters in Ruth Joffre’s stories are, literally and figuratively, sleepwalking through ‘some dark and frightful dream that our minds had conjured,’ and it's a testament to Joffre’s meticulous and abundant talent that she can guide the reader through these constrained and inhospitable spaces. No matter how dark the stories become, her language, so precise and beautiful, shines a light so that you can go deeper into these worlds, where no one else has ever been. A wonderful debut." "[Joffre's] stories are fairy-tales for a world that doesn’t know what it is anymore. They are reflections of a future that remains uncertain even as the world seems to fracture. Like water, these stories will seep into you, filling you past the point of bursting. For that, you will be grateful." "A fearless and startlingly talented writer… [ Ruth Joffre blends] the quiet horror of Mary Gaitskill and the reality-bending mischievousness of David Lynch and Kelly Link. You will leave this book gratefully unsettled." "Ruth Joffre turns the lights on all around her characters yet still permits them their mystery, so that beneath their sharp lines and vivid colors one senses something considerably darker and more enigmatic. They face you not like constructions on a page but like people in the world." "Hypnotic and elegant, Night Beast built to a resonance that resounds in me still. These stories are unforgettable, full of longing and hunger and alert tenderness. Finishing the collection was like waking from a night of disquieting and luminous dreams. I did not want this book to end." "Joffre joins an exciting group of women writers writing about the female body and desire. ...[Her] fearlessness to dive into the murky waters of longing makes this an original and startling debut."